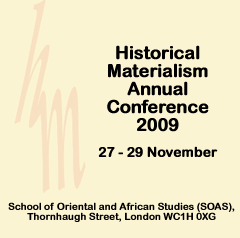 The latest issue of Turbulence (number 5) was officially launched at the 2009 Historical Materialism Conference at the School of Oriental and Asian Studies (SOAS) in London last November. We did so with a panel chaired by Matteo Mandarini, with John Holloway as a discussant (thanks to both for their participation!) Turbulence editors participating were: David Harvie, Keir Milburn, Tadzio Mueller and Ben Trott. An MP3 of the presentation of the new issue, John Holloway’s response, and the discussion which followed has been made available here.